Then there was the tragic theater shooting in Aurora, Colorado. Due to a similar scene featured in the film and its trailer where mobsters shoot up a cinema, the movie went into heavy editing and was pushed back to January of all months, in 2013. As we all know, heavy editing, reshoots, and January releases are all bad signs. Nonetheless, I attempted to remain optimistic about the project. Alas, I shouldn’t have shielded my eyes from the signs. Josh O’Mara (Josh Brolin) is an LA cop with a reputation for his headstrong and fearless attitude, a relic of his participation in World War II that he’s never been able to shake loose, even with a baby on the way. O’Mara wants more than anything in the world to take down Mickey Cohen (Sean Penn), the most powerful figure in the crime underworld who isn’t shy in his ambition to expand his territory. A chance of a lifetime is presented when Chief Bill Parker (Nick Nolte) instructs O’Mara to recruit cops to partake in an off-the-books vigilante-esque war against Cohen. No time is wasted in the recruitment of Sgt. Jerry Wooters (Ryan Gosling), detectives Coleman Harris (Anthony Mackie), Conway Keeler (Giovanni Ribisi), Navidad Ramirez (Michael Peña) and Max Kennard (Robert Patrick), who refer to themselves as the “Gangster Squad”. The movie wastes no time in throwing down the foundation and getting the ball rolling. Exposition is doled out in a blur and characters are introduced with minimal depth and characterization save for some unique (and clichéd) quirks. We’ve seen these characters before, know what makes them tick, know their roles in the overall plot, and know where they’ll be when the credits roll. Not even their likable actors can save them here. We’ve got our antagonist whose dialogue is littered with analogies in an attempt to appear profound; our damsel in distress; our ex-soldier who never left the war; our loving, but caring housewife; and even our family man who may or may not be in for some extra turmoil for the sake of audience manipulation. Stylistically, the movie is closer to, say, a comic book film than a crime noir. Presumably, that was the goal of the movie – the “blockbusterization” of the gangster genre. This could have worked, but some uniqueness in style would have really compensated for the lack of strong narrative or character development here. It’s entertaining on a blockbuster level, what with violent and explosive shootouts to hold your attention, but it does get a little too absurd at times, even for what it was shooting for. 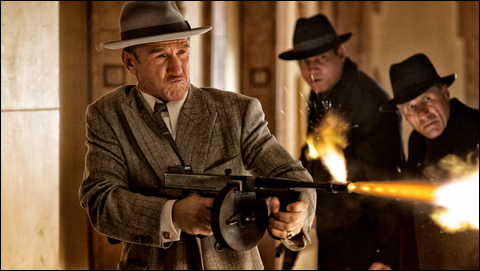 Gangster Squad could have been a fun parody of the gangster film, but it lacks the script, style, and direction to be more than a flat dime a dozen popcorn flick.